Knowing and understanding your Twitter Statistics is a good way to motivate yourself to continue posting quality content on the Twitter network. Posting on Twitter is as much about knowledge sharing and listening, as it is about having conversations and networking in up to 140 characters at a time. Until a couple of weeks ago, we used to be able to track our Twitter Grade using a free tool which was offered by Hubspot called Twitter Grader. Sadly, this tool has been retired and replaced with Marketing Grader. Marketing Grader has some benefits, but I know there will be a lot of people missing Twitter Grader. That’s the problem with free tools though, the developer may decide to discontinue offering them at any time. So where do we go to measure the success of our Twitter presence? 1. Twitter Counter will show you how long you’ve been on Twitter and allow you to compare your twitter handle with one other handle at a time. It will also show you your worldwide reach and provide simple charts showing your growth. If you want to track your Twitter follower growth you can do that with a free version of the account as well. The pro version offers a lot more detail including historical data, number of mentions and retweets, and PDF reports. The pro offering looks like a great option for agencies. 2. RetweetRank will allow you to measure yourself up with a retweet rank number and percentile. If you log in with your twitter account, you’ll see how many retweets you’ve received and tweets you’ve posted over the past week. If you want to specify a date range to get more of those statistics, you’ll need to upgrade to the pro version, which starts at $5/month for a personal account. There is a 14 day free trial though, and I believe the best way to learn is to through playing, so I encourage you to try it before you buy it and get to know your Twitter retweet ranking statistics quickly. 3. 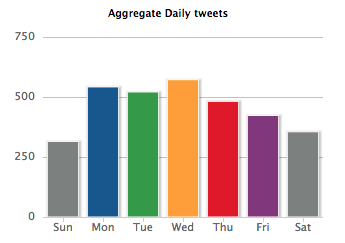 Tweetstats has lots of pretty charts for you to drool over and all it requests is a donation. This one is well worth exploring, just know that it may take a bit of patience before it shows you all of your (or your competitor’s) Twitter statistics and charts. There is also a new analytics feature that Twitter itself has recently rolled out. See http://analytics.twitter.com It started out being only available to Twitter advertisers, i.e. people or businesses who advertise on Twitter. Stay tuned to see if Twitter rolls out analytics for individual accounts holders who are not yet advertising. What are your favorite tools for measuring Twitter statistics? Do you miss Twitter Grader? And what do you think about Marketing Grader? Please share your thoughts in the comment area below. Awesome Web-site, Carry on the good job. Thank you, Aretha! Please let me know what other topics you are interested in reading about. We do trust the many suggestions you may have offered with your publish. They can be pretty persuasive which enables it to certainly operate. Nonetheless, the particular blogposts are so speedy to start. Might just you want prolong these people just a little coming from the next time? Appreciate the actual article. Thank you for the auspicious writeup. It in fact was once a enjoyment account it. Look complicated to far added agreeable from you! By the way, how can we keep up a correspondence? I’m nnot sure whether this post is written by him aas nobody else know such detailed about my difficulty.You are amazing!